HOW COULD GENUINE or authentic dharma be defined? Genuine Dharma can cleanse whatever impure or confused concept we may have, and in this way the Dharma pacifies kleshas, or the afflicting emotions. The word in Tibetan "cho" (chos) has many different meanings, and one of them is phenomena or something that appears like this. The phrase can also mean the Dharma that appears like this, because the word for phenomenon and Dharma is the same in Tibetan. The dual meaning here points to whatever appears and also to the true nature of whatever it is that appears. The term operates on both an ultimate and relative level of meaning. In this context cho refers to the external and the internal world which belong to the level of apparent reality. The external world, which is often called the environment or the vessel, refers to phenomena such as mountains, valleys, rivers and so forth--what we generally know as the environment in which we live. The internal world refers to the inhabitants of this environment, or the sentient beings of the six different realms. How is it, then, that we become confused or deluded by samsara and so remain caught within it? Clinging to samsara deludes us. It is not through the appearances of the six different realms of sentient beings or the external world of our environment that we are bound and confused: it is our attachment to these that binds. As Tilopa spoke to Naropa: "My son, we are not bound by appearances; we are bound by our clinging to them." If we do not examine or analyze samsara, using our intelligence to see what it really is, we could remain in a certain kind of happiness or pleasure. This would indicate, however, that we have not looked directly into samsara and analyzed it carefully. We must use our intelligence to look into the many different forms in which sentient beings appear: large, small, and so forth, and into the great variety of forms we see in the environment around us. We could analyze all these to discover the cause and conditions for their arising. To look at the existence of beings, we can look at our minds and body and see how it is that they create karma. If we investigate like this, we will begin to understand how our realm of existence comes into being, and we will see that the nature of samsara is suffering. Traditionally, suffering is divided into three different types: all-pervasive suffering, the suffering of change, and the suffering of suffering. How then do we liberate ourselves from samsara? It is not through our body, but through our mind. All the various kinds of suffering that could possibly appear are experienced by the mind, and so it is through the mind that we are liberated from them. The karma that we have is not something substantial or material; it is of a mental nature. For example, if we take the metaphor of the body as a car and the mind as the driver, then it is clear that whether a car goes to the north or the west, or whether it goes up the mountain or down into the valley, depends upon the driver. It is the mind that determines what actually happens. The body has various experiences which are the basis for accumulating virtue or unwholesome karma, but what kind of karma it is really depends upon the mind. Whether we attain liberation or the Buddha's omniscience depends upon the mind. Our birth into any of the six realms also depends on the mind. For all these reasons, it is very important to train our mind, to familiarize it with the authentic Dharma. There are many different ways of doing this: shamata or calm-abiding; superior insight or vipasyana meditation; and the various methods for purifying negative activities. Another way to train our mind is to read spiritual biographies of the masters, called "namthar." These aid our practice because they inspire our faith, trust, and belief, helping them to grow. So there are many different ways of practicing the Dharma, and the goal of them all is to blend our mindstream together with authentic Dharma. In this teaching, following the tradition of listening to spiritual biographies, we will be looking at that of Jetsun Milarepa. Famous and revered among all four lineages in Tibet, Jetsun Milarepa belongs in particular to the Kagyu lineage, which is especially known for faith and devotion. It is often through faith and devotion that the true nature of the mind is discussed. Milarepa's lineage comes down through Vajradhara (Dorje Chang) to Tilopa, the Indian Siddha who met Vajradhara directly face to face. Tilopa passed his lineage on to Naropa, and these three figures belong to the Indian history of the lineage. Vajradhara, of course, is the symbol or the visualized form of the dharmakaya which has no form, so when we speak of meeting the lama face to face as Tilopa met Vajradhara, it is not as if two people are meeting on a street comer. It means that Tilopa realized the dharmakaya, and it is out of this realization that the lineage flows. The Tibetan part of the lineage starts with Marpa the translator (Marpa Lotsawa), who went to India many times to obtain teachings from Naropa. Marpa passed on this lineage to his disciple Milarepa, who then transmitted it to Gampopa. These three are often called in Tibetan "Mamiga sum": "ma" refers to Marpa, "mi" to Milarepa, "ga" to Gampopa, and "sum" means three. 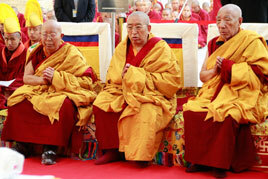 These three are considered the fathers of the Kagyu lineage within Tibet. As we have discussed, attaining the level of Buddhahood and practicing the genuine Dharma depends mainly upon the mind. From beginningless time to the present, we have accumulated negative karma, which includes two main kinds of obstructions: the cognitive obstructions, and the afflictive or emotional obscurations. Both of these depend on habitual mental patterns. To purify all of these we must purify the mind, and when this is accomplished we attain the tathagatagarbha, or Buddha nature, the level of Buddhahood which is also called stable peace or stable bliss. 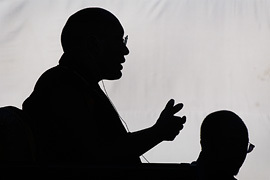 One way to move towards Buddhahood is to listen to spiritual biographies. Milarepa's spiritual biography is divided into fifteen sections and we will look at the first nine of these. The first tells of how he was born and of his family history. The second deals with his study of black magic, how he destroyed the house of his aunt and uncle and sent hail into the valley. The third treats how he met the genuine Dharma. The fourth covers how he practiced strictly according to his master's word. The fifth concerns the initiations he received and his yidam practice, including how the deities directly appeared to him. The sixth chapter deals with his first retreat, where he stayed for eleven months. The seventh shows how he came out of retreat, met Marpa for the last time, and returned to his home country. The eighth tells how he came home, experienced the suffering of having lost his parents and his family, and then travelled to White Horse Tooth Rock Cave to practice. The ninth chapter covers the various austerities in which he engaged. From a Dharmic point of view, Milarepa's lineage comes through Vajradhara, Tilopa, and Naropa, but in terms of his family lineage, he was born in a northern area of Tibet in a place called Kya Ngatsa, and his father's name was Sherab Gyaltsen. How did the name Mila come into his family? 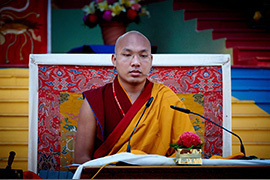 The earliest record of the family goes back to Khyungpo Josay, who was the son of a Nyingma lama. He was a naljorpa, or a practitioner very skilled in mantra. Khyungpo Josay went on a pilgrimage to another country, which was plagued by many ghosts and elemental spirits. If you believe in these beings, you are prone to see them. Apparently in this area there were many people who believed in them and Kyungpo Josay, who was skilled in subduing spirits, gained quite a reputation and also financial rewards from his ability. Once there was a family who was plagued by a powerful demon, but they had no faith in Khyungpo Josay's skill. 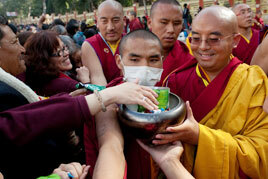 They called on many other lamas who did numerous prayers and performed many ceremonies, but nothing helped. A friend of the family told them: "There is one man who can help you and his name is Khyungpo Josay, you should invite him." The head of the family replied: "I don't really like him, and I don't believe in him. He probably won't help very much, but if you have a wound and dog fat will help to heal it, well then, you'd better try some." Thinking like this, he said: "Go ahead, invite him. Maybe he can do something." So Khyungpo Josay was invited, and as he was coming along, he sang a song: "Wherever I go, all demons and spirits are tamed. No one can ever escape me!" The demon got wind of this and was terrified. He came to Khyungpo Josay and said: "I won't disturb this family anymore, and what's more, wherever you go I won't make any disturbances. Just don't put any obstacles in my way. Please don't give me a hard time." Actually, the first word the demon uttered when he met Khyungpo Josay was "mila!" This means something like "O, what an amazing person!" or "What a powerful being!" "Mi" means human being or man, and "la" here emphasizes or underscores what a powerful being he was. This is how Milarepa's ancestors received the name Mila. Khyungpo Josay had a son, whose name was Mila Dhoton Senge, and his son was called Mila Dorje Senge. Mila Dhoton Senge and his son, Mila Dorje Senge, migrated to Kya Ngatsa, where they remained, accumulating a great deal of wealth and possessions. Mila Dorje Senge married a young woman from his village, and they had a son, Mila Sherab Gyaltsen, who was the father of Milarepa. At the age of 21 Sherab Gyaltsen married Nyangtsa Kargyen, who was to become Milarepa's mother. The couple lived in their village of Kya Ngatsa (also known as Tsa) where they were very happy and lived a life of ease. If we go back one generation from Milarepa's father to Mila Dorje Senge, it is important to know that his cousins also moved to Tsa. Their names were Yungdrup Gyaltsen, who was the evil uncle, and Khyung Tsha Peydon who was the evil aunt. When this aunt and uncle arrived in Tsa, Milarepa's family, who had been settled there a long time, had a wonderful house, land, and a thriving business in trade. According to the custom, Milarepa's family helped their relatives to establish a business, to find land and to build a house, and so things went well for these relatives as well. The father replied: "This is truly wonderful. Within each generation of our family, there is only one son born. I am delighted to hear that this son has been born, and I will call him Thopa Ga." "Thopa" means to hear, and "ga" means happy or joyous, so his name meant "Milarepa a Joy to Hear" or "Milarepa Good News." This name actually accords very well with Milarepa's attributes, since later as a great practitioner he sang wonderful songs, and when people heard them their minds were filled with delight. After a while, the father returned home and gave a big celebration in honor of their son. A few years after Milarepa's birth, a daughter was born into the family and she was called Peta Gonkyi. When Milarepa was seven years old, his father, Sherab Gyaltsen, became very sick. Realizing that he was not going to recover from his illness, he called together all the relatives for a meeting, which included Yungdrung Gyaltsen and Khyung Tsha [Peydm], the evil uncle and aunt. The father told them: "I am giving you the responsibility of my lands and all my goods, the house and so forth, because I realize that I will not get over this illness. You must take care of everything until my two children come of age. Please see to it that no harm comes to them, protect them from difficulties, and help them in whatever way you can. He also said that Zessay, a young woman from the village, had been promised Milarepa as his future wife through arrangements made with her parents. When Milarepa was of age, he was to be married to her, and all the property was to be given over to them. A letter was written as a testament, and signed and sealed. The aunt and uncle agreed to carry out these wishes, and having settled his affairs, Sherab Gyaltsen died. Afterwards, the aunt and uncle took the money and the land, everything entrusted to them, and used it for their own benefit. Milarepa, his sister Peta, and his mother were forced to work as servants for the aunt and uncle. They were given clothing and food that was of lower quality than the other servants, and burdened with a tremendous amount of work. The aunt and uncle made it extremely difficult for them. The mother, however, had managed to find a little bit of funds, and when Milarepa was fifteen years old, she bought a lot of beer, and invited the people from the village, including the aunt and the uncle. She said to them, "Thopa Ga, Good News, is now 15 years old, and it is time for him to get married to Zessay, his fiance, and to begin his own life. Now please give us back what has been entrusted to you for all these years." The aunt and uncle replied, "We don't have anything to give you. We have been taking care of you for so long that you have used up all your resources. There is nothing here for you, not even a needle or a thread left to give you." They spoke at length like this, denying that there was anything left. In addition, they beat Milarepa's mother. The parents of Milarepa's fiance, Zessay, were kind to him, giving him new boots and clothing. They comforted him, saying, "Wealth is nothing permanent, but something that is made by people through their work. In the beginning your ancestors had no money, but they made it through working. For lack of money, don't be disappointed or discouraged. You must study and develop capabilities, and while you are doing this, whatever you need we will provide for you." In this way, they inspired and comforted him. Milarepa's teacher from the village, as was often the case, was also the local priest, and he went around to the different houses performing pujas and so forth. Milarepa accompanied him as an attendant, and on these rounds, they were often given food and drink. One day when Milarepa was returning home earlier than his teacher, his mother was on the roof of the house and saw him coming. Milarepa was a little bit tipsy and singing a song. When his mother saw this, she became outraged and yelling at him in a loud voice, came tearing down the steps of the roof with a stick in her hand. This stick was one used to push a stone mill to grind barley for tsampa, so it was quite a powerful one. She came after him with this stick, crying: "Mila, you are a child with no father, and you are going around with your belly full of food and singing away drunk. Your sister and I are here in great suffering. What are you doing? Your mind has become totally deluded. Your aunt and uncle have taken all of our cattle and our money, and here you are just wandering around drunk. We had great hopes that you would study and at least learn how to earn some money and develop good qualities, yet here you are wandering around in the gutter." Milarepa then wept and said: "You are right. I have been behaving terribly, and whatever you say I will be glad to do. I had a little bit to drink at the house of a patron, but the song that I sang arose out of sadness. In the future I won't drink. Please be patient with me." Milarepa and his mother stood there crying, and his sister Peta joined them. While Milarepa was studying, Zessay provided him with what he needed, but the mother now said: "I will take a job in another house, and I will work to get money for your clothes, your boots, and food. I will provide you with what you need. 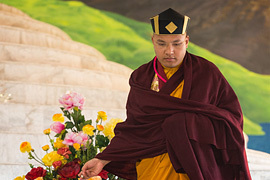 In our family there is a lineage of men who have been powerful in the use of mantra, and so I want you to go to a capable and skilled lama from whom you will learn how to perform various kinds of magic. Do this until you can create various signs that everyone can see. It must be obvious that you have these powers. If you can't do this I will jump off the roof of the house and kill myself. If you can do it, I will offer wonderful prayers for you. Milarepa's mother sent him on his way, and he arrived in Utsang, the central part of Tibet, where he met Yungton Trogyel of Kyorpo. From him Milarepa learned black magic and also how to send hailstorms. Back in his village of Tsa, the aunt and uncle's son had come of age, and in their house they were giving a large party for him to which many relatives had been invited. Through his black magic, Milarepa was able to make the house collapse and thirty-five people were killed. Through his other magical powers, he was able to send hail on the village and that destroyed the harvest. His mother was filled with happiness. She took all the red cloths she had, tied them to the end of a stick, and, waving it like a victory banner at the top of the house, she communicated in a loud voice to the whole village the following message: "The son that was born to Sherab Gyaltsen and myself has come of age and has been helpful to us. He has given an answer to our enemies and conquered them. My mind is finally satisfied. I am happy. Now if there are others in this village who wish to harm us, please come forth." With such proclamations, she went around the village. Although Milarepa's mother was delighted with all his feats, Milarepa himself was disappointed; he had a sense that it was not right to kill and to send hail which had caused such destruction. His mind became a bit depressed, and while he was staying with the teacher who taught him these magical powers, he began to think: "I have given an answer to my enemies, and I have become very famous, but I have also committed great negative actions. The only result of these actions for myself and for my mother is rebirth in a hell realm. The only way to free us from this is to attain Buddhahood in this lifetime. There is nothing else that can help." Steeped in these thoughts, Milarepa was disturbed and uneasy both day and night. He did not dare mention this discomfort to his teacher, but kept it inside. One day the teacher came to Milarepa with, literally, a "black smile", an uncomfortable or unnatural smile indicating that his mind was not at ease. Milarepa asked him: "Why are you wearing this black smile today? What is the cause of this?" The teacher answered: "I had an excellent sponsor who died last night. All things that are composite are impermanent. Through exercising magic and sending hail, I have been able to accumulate a bit of wealth in this life, but when it comes to death, this will not help me. The only thing of benefit is the practice of Dharma, and that is what I wish to do. But I am old now and it is difficult to practice, yet since there is no other way to liberate myself from the evil consequences of my deeds, I must do it. You, on the other hand, are not as old as I. You have a lot of energy and diligence and could practice genuine Dharma. Doing this, you would be able to attain in one life the level of Buddhahood. You could liberate the consciousness of all the beings we have killed." Milarepa was very happy to hear this: "That is the way it is. Yes, I have been thinking like that myself, but I haven't spoken of it to you. I will practice Dharma. Please tell me the name of a lama who can give me the teachings that lead to liberation in one life, in one body." The teacher replied: "This is excellent. You practice the Dharma, and I will provide you with what you need and help to create favorable conditions for your practice. I know of a wonderful lama, Rongton Lhaga, who teaches the Great Perfection, Dzogpa Chenpo or Mahasandhi tradition, and you should go and study with him." Milarepa was delighted to hear the name of this lama, and he thanked his teacher for advising him. He said: "I will accomplish what you suggest, and I will complete this practice, achieve in one life, in one body, the level of Buddhahood." Milarepa then went to the western part of central Tibet and came before the lama Rongton Lhaga. Having bowed to him, he said: "I am a man who has committed great negative actions. I have tremendous fear of samsara; therefore, please teach me the Dharma which will allow me to liberate myself in this life." The lama replied: "If you can practice from the depths of your being, if you can totally involve yourself in this practice, then if you meditate for one day, this Dharma of the Great Perfection that I teach will bring liberation in one day. If you meditate only one night you will be liberated in one night. 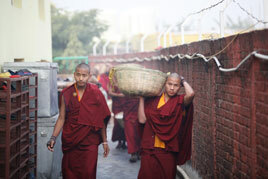 For fortunate beings, merely hearing this Dharma will bring liberation." Milarepa thought to himself, "Well, I must be one of these fortunate beings, who once they hear this teaching will be able to realize liberation in one life. In only twelve days of studying and practice, I was able to achieve the magical powers that allowed me to destroy the house and produce hail. No one else was able to do that, and so I am sure I can accomplish this practice. All you have to do is hear it and your mind becomes happy. I have heard this, and I feel pretty happy." Thinking in this way, Milarepa went and slept for seven days. 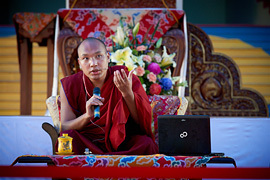 After a week passed, the lama came and inquired: "What kind of experiences did you have? What kind of realizations arose?" Milarepa replied: "My mind is most peaceful and happy. I've had a fine time sleeping here." The lama responded: "I probably gave you this teaching a little bit too early. You are someone who has accumulated a lot of negative actions, and although this teaching has great qualities in it, I am not the one who will be able to train you. We don't have the karma to be teacher and disciple. You should go to a country called Drowolung, in southern Tibet where Marpa the Translator lives. He is skilled in the secret mantrayana. You should go and study with him." When Milarepa heard the name of Marpa, an inexpressible experience of joy arose within him. He set out on the road to Marpa's house and came to a place called Dharma Ridge, where children were playing. A man, who was covered with the dust of the road, stood nearby. Milarepa asked him: "Where is the king of translators, Marpa's house?" The man replied: "I don't know where the king of translators is, but there is a Marpa who lives over there." And he pointed down the road, which Milarepa followed thinking: "This must be the way to Marpa's house." The night before Milarepa was to arrive at Marpa's house, Marpa's wife, Dagmema, had a dream. In that dream, Naropa presented a crystal stupa, which had a slight bit of dirt, and along with it a golden vase. With the water in the golden vase, Marpa purified the crystal stupa which was placed on the peak of a mountain. From this peak, luminous rays of the sun and the moon filled the trillocosm. That night as well, while Marpa was resting in clear light, a dream came to him in which Naropa appeared and gave Marpa a golden dorje, which also had some dirt on it, and along with it, a vase. With the water of that vase, the stains were washed away from the golden dorje, and it was placed on top of a victory banner from whence light radiated to the whole world. The next morning Marpa awoke with a certain pride, meaning that he felt there was something beneficial and good to accomplish. Thus when Dagmema came to bring him his morning meal, they told each other of their dreams. Dagmema asked Marpa: "Are these dreams good omens? Do they foretell positive causes and conditions?" Marpa replied: "They are dreams, and dreams aren't true. Nevertheless, I am going out to plow the field today. Get me some good beer." Dagmema was surprised: "You never plow the fields. Never. You are a great lama. Why are you going out and plowing the fields? People in the town are going to talk, and I'll be embarrassed and shamed by all of this." But Marpa did not listen to her. He drank a full measure of beer, got a little bit drunk, and took another vase with him out while keeping a sharp eye out for whoever was coming along the road. Milarepa was walking along the road and came upon a group of children playing. Among them was a child who was well cared for and had long hair that was slicked down with oil. This was Karma Dode, Marpa's son. Milarepa inquired of this young child: "I am looking for the king of translators, Marpa, who is supposed to live in this area. The child replied: "You are probably looking for my father. I will lead you to where he is." So they walked along the path and came to a field where someone was plowing. This person had a well filled-out body, with a certain brilliance radiating from it. The field was all plowed, but for a small part that was not yet finished. As soon as Milarepa saw this person, he was filled with such an intense emotion that he was unable to speak for awhile. When words came, Milarepa asked: "Do you know where the palace (the polite way of saying house in Tibet) of the king of translators, Marpa, is?" Marpa took a long, slow look at him from head to foot, and said: "You stay here. Drink this beer, plow the field, and I will introduce you to Marpa." Milarepa finished off the pot of beer and plowed the field. Before long the child whom he had met before came to him and said: "Come with me. The lama said to come, and I will lead you there." Milarepa did not leave right away, but finished plowing the field and then went to Marpa's house. There Milarepa found, sitting on two cushions covered with a rug, the same man who was plowing the field. Marpa said to him: "I am Marpa, so you can make your prostrations now." Milarepa offered his prostrations and said: "I am a great sinner and have committed tremendous negative actions. I offer you, however, my body, speech, and mind. Please give me food, clothing, and the teachings of Dharma so that I can in this one life attain the level of Buddhahood." Marpa responded: "It doesn't really concern me if you have committed all these negative actions. What is important is that you have offered me your body, speech, and mind. Now as for food, clothing, and Dharma: If I give you Dharma, you will have to get your food and clothing elsewhere. If I give you food and clothing, you will have to get your Dharma elsewhere. So this depends on you. Whether you attain enlightenment or not—that depends on you." Milarepa decided to receive Dharma from Marpa and to find his own food and clothing. In order to gather these together, Milarepa had to leave for the countryside. Wishing to leave his precious texts in a safe place, he put them in Marpa's shrine hall. When Marpa saw them there, he exclaimed: "Take those books back! They are covered with obscurations. They stink of your negative practices and will pollute all my texts. Remove them immediately from the shrine hall." Milarepa thought: "Marpa probably thinks these are my black magic texts." And he took them out of the shrine hall. So, Milarepa had chosen to receive the Dharma from Marpa and provide himself with food and clothing. In order to beg for these, he went to the areas surrounding Marpa's home and received twenty-one measures of wheat, fourteen of which he used to buy a large copper pot with four handles. Milarepa had to go a long way on his begging rounds, and the road back was very difficult for him shouldering the big pot and heavy load of wheat. When he returned to Marpa's house, he was very relieved and quickly let his burden drop onto the floor of the house. It shook. Marpa left the meal he was eating to come and speak to Milarepa: "Young man, you are very strong. Dropping this load of grain you carried has shaken the whole house. Perhaps you are getting ready to kill me." (Marpa was recalling Milarepa's black magic that had caused his aunt and uncle's house to collapse and kill many people.) "Don't leave this grain here. Take it out!" Milarepa thought: "Well, Marpa's a little quick to anger. He's the wrathful type." So he took his sack of grain outside and left it there. He then offered Marpa the copper pot with the four handles, saying: "Please give me the secret oral instructions that will allow me to free myself from suffering in this lifetime." Marpa lifted up the cooper pot and said, "I offer this to Lord Naropa." Tears came to his eyes and he made a prophecy: "You gave me an empty pot and this means that in this life while you are practicing in retreat, you may have a bit of difficulty with food, but when I hit the pot it gave off a wonderfully resonant sound. This is a sign that you will become very famous. The four handles facing the four directions are a sign that I will have great spiritual sons." (Milarepa would be one of them.) Finally, so that the lineage that Marpa was carrying would be rich and prosperous Marpa filled the copper pot with ghee (liquid butter) and inserted many wicks so that it glowed with the warm light of a great butter lamp. "In the future, this copper pot should be placed within a great stupa," he said. In response to Milarepa's request for the Dharma, Marpa replied: "I've heard that you killed a number of people with your magic by sending hail. Is this true or not?" Milarepa had to admit that it was true. Marpa then told him: "In the village behind you, there is a place where my students must pass when they come to see me and the villagers treat them terribly. They beat them, they steal from them, and sometimes they don't even let them through. I want you to go there and send hail onto this village. If you can do it, there is no way that I could not be able to give you this precious, profound lineage of Naropa I have received with such hardship." Milarepa walked to the village and spoke to the people there, telling them how poorly they had treated Marpa's students and that there was no reason for this. He berated them severely and they responded with anger, attacking and beating him. As they were ready to kick him out of town, Milarepa said, "You've made problems for the lama and his students, and now I will make trouble for you. Through my magic, I will send a powerful sign to you. It will not be pleasant." Milarepa left to perform his magic, and this time the result was to make the villagers fight, beating and knocking each other down. They finally realized that this was the result of Milarepa's magic, so they came to see Marpa and apologized. They offered their good will and promised not to hurt his disciples as they came through the village. Afterwards, Marpa gave Milarepa a new name, the Gentleman of Great Magic. Having fulfilled this task for Marpa, Milarepa again asked for the teachings. And Marpa said: "Well now, there is another place a little bit distant from here, and the people in that village also give my students a hard time creating all kinds of difficulties for them. So I want you to go and send hail on their harvest. And then once you have done that, I will give you teachings." With the thought that in accomplishing the commands of the lama, he would obtain the teachings and thereby the level of Buddhahood in this life, Milarepa left for this second village. When he came to the countryside nearby, he stayed with an old woman. At this time of the season, the harvest was growing very well, and crops were flourishing. Milarepa told the old women that he was going to send hail and it would not only destroy the crops, but when the hail melted, the water would carry away the topsoil. The old woman became very depressed at the thought of losing her land and harvest. So Milarepa suggested that she draw a picture of her land. He took a metal pot and covered the part of the map that was the old woman's land except for a little piece of it. He then performed his magic and the hail came. The harvest was destroyed and the topsoil was carried away, except for the small piece of land that belonged to the old lady. The small portion that was not covered by the pot was also carried away, but all that was covered was saved, while the rest of the village was devastated. The villagers were stunned and surprised that everything was destroyed except for the old woman's land. They came to speak with her: "Why is it that your land was not destroyed?" She replied: "Well, I kept by me a little monk who was very clever. I gave him food and lodging. You should ask him. So they went to Milarepa. "Why did this happen?" they asked. He answered: "You have made a lot of trouble for the students of my lama Marpa. If you go to him and confess, then in the future such things will not happen." So they went to Marpa and confessed, promising not to harm his disciples. Afterwards, thinking about what he had done, Milarepa became depressed and discouraged. In the past he had killed human beings and he now realized that in sending hail he had killed a lot of small sentient beings as well. "If I think of the causes and conditions for rebirth in a future life, I have killed many people, and now I have killed small sentient beings as well. I haven't been able to practice the Dharma properly and certainly I'll be born in the hell realms." He went to Marpa and begged him: "My negative activity is increasing and certainly in the next life I will be born in a burning hot hell. 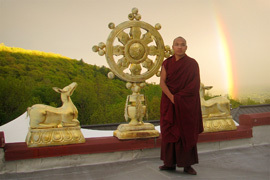 Please, through your great compassion grant me the teachings of the Dharma." Marpa said: "Indeed you have committed many negative actions and the antidote for the karma you have accumulated is the Dharma. However, if you think right now you are ready to get the precious Dharma for which I had to accumulate much gold to offer Naropa, and then travel along the hazardous route to India, if you think you are ready to get this now, you are overstepping yourself. Whatever work I have set out for you, you have done earnestly and well; however, in order to receive my Dharma, you must be someone who is willing to put their whole heart into it. Only that kind of person can truly receive my Dharma. Now I am going to test you to see if you have that kind of heart. I want you to build a house for my son Dharma Dode. Once you have completed the house, I will give you the Dharma, and not only will I give you the Dharma, I will give you food and clothing as well. Milarepa asked, "What happens if I die building this house before I can receive the Dharma?" Marpa promised: "I guarantee you will not die in building this house. You will receive the Dharma." Not far from where Marpa lived there was some open land in the middle of a village. The residents had all agreed that no one would own this land and it would be held in common. They all signed a paper to this effect, except for Marpa, because he wanted to build a house there for his son. But he had to be clever about it. If he just went there and built it, the villagers would protest, so he had Milarepa first build a round house in the eastern direction. When Milarepa was half finished, Marpa said: "Well, I really don't think this turned out very well." He told Milarepa to tear it down, return all the stones to the place where he had taken them, and all the earth back to the holes where he had dug it. So Milarepa returned all the stones to their place, all the earth to where it belonged, and then went back to Marpa: "I have followed all your commands, now please teach me the Dharma." Marpa replied, "It is not quite time yet. On the peak to the south, I want you to build a house in the shape of a hemisphere. Once you have finished building it, I will teach you the Dharma." Milarepa again went out and started collecting stones and earth and began to build up the walls of this second house. When he had gotten quite far along, Marpa came to see him: "Who told you to build this house?" Milarepa said, "You are the one who told me to build it." Marpa replied "I must have been drunk or crazy. I don't remember anything about telling you to build this house." So Milarepa again had to take down the house and return all the stones and all the earth back to their places. Having completed the task, Milarepa went back to Marpa and said, "I have finished all the work you told me to do. Please grant me the teachings of Dharma." Marpa said to him "Now in the future you shouldn't be doing work that you weren't told to do. Actually what really needs to be built is a triangular-shaped building, which should be put on a peak in the western direction. If you finish this house, I will teach you the Dharma, and not only that, I will celebrate it with a great feast." This time Milarepa was a little anxious about the directive: "Lama Rinpoche, Precious Lama, the first time you said you hadn't thought it through very well, it wasn't what you really wanted, and the next time you said you really didn't remember having told me to build that house. Now again you are telling me to build a triangular-shaped house. Would you mind if I brought in your wife as a witness to this?" Marpa agreed that his wife Dagmema could be the witness. Dagmema said: "Maybe this is work my husband doesn't really need. I am not really sure what the reason is behind all this work he has given you, but if it is done for the sake of the Dharma, then it is good work so I will be a witness." They wrote a letter that said once these walls were built, they would not be torn down and that Milarepa would receive Dharma teachings. One more time, Milarepa went to gather together earth and rocks to make a house, and slowly the walls of the house were built up. It was such heavy work however, that large sores began to appear on his back. Since he could no longer carry things on his back, he carried them on his hip, but then sores also developed there, and so he carried things on his chest and sores developed there. He was surrounded by sores, and not only that, the water and earth he was carrying to make mortar entered into them and it was very painful for him. 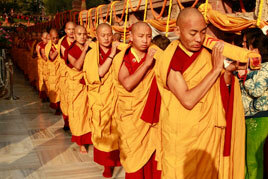 Yet he thought, "Well, this is the command of my lama" and continued his work with diligence and energy. Though he was in such pain Milarepa reflected: "I can't really show these sores or speak of these problems to Marpa because he is a very high lama and also he would probably get angry with me. His wife is full of compassion and kindness but if I show them to her, she would probably think I am proud of all the work I've done." With no place to turn, he was filled with despair and weeping in the house. Dagmema came and asked him why he was crying, but Milarepa did not reply. She lifted up his chin and said: "Don't cry, you will get the Dharma teaching." Milarepa finally told her his real feelings: "You are kind to me as a mother. And in order to obtain the precious Dharma, I must build this house. Yet in building this house my body is becoming nothing but a huge wound. Until now I have worked as hard as I can carrying stones and earth, but it is extremely painful." Dagmema now looked at Milarepa's body which had been covered before, and seeing all his festering, open sores, she cried: "You are right. I've never seen such wounds on a human being before. Your situation is even worse than an animal's. A horse only gets saddle sores on its back, but you have them all over your body. I don't understand why Marpa is making you go through all of this. But stay here and I will take care of you. I will go to Marpa on your behalf and try to see if I can't arrange for you to receive the Dharma." Dagmema went to Marpa and described to him what Milarepa was going through, and Marpa also cried, "Such diligence and great effort made for the sake of Dharma and to fulfill the commands of the lama makes me very happy." Marpa agreed that until Milarepa's wounds were healed, he could stay; Dagmema could give him good food and bring him back to health. She took good care of him and Milarepa was happy. His mind, however, was not satisfied; he had not yet received the Dharma. One day, Marpa was giving the initiation of Chakrasamvara (Demchok). 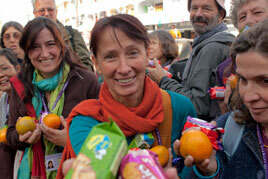 Many of his students had come and brought wonderful offerings. Milarepa also went and happily joined the crowd. But Marpa looked at him and said, "What do you have to offer?" Milarepa replied, "Well, I've been building this house and that's my offering." Marpa admonished him: "You're building this house but it's not finished. It's a finished house that you must offer." And he chased Milarepa away, but Milarepa did not leave immediately even though he'd been told to. He made his request again: "Please, let me stay and receive this initiation." Marpa came up to him, cuffed him across the face and tossed him outside. Milarepa went sobbing to Dagmema, who comforted him, "Don't worry. Slowly, with time, you will receive the Dharma." Sometime after this initiation, Marpa came to Milarepa. "We had a little bit of a go-to the other day. Has your mind not turned against me for this?" Milarepa replied, "I have committed monstrous negative actions. They are the cause of the bad things that happen to me. My faith in the lama has not changed, not at all." Marpa said, "That's true. I went through great difficulties in order to bring the Dharma back from India. So now, you go back and finish building the walls." One day, Marpa came to Milarepa who was in the process of building the triangular-shaped house. "Great Magician, who told you to build this house?" "Lama, you were the one who told me to build this house." "This is a triangular-shaped house. Triangular-shaped houses are for evil magicians who use mantra in their practices. What are you doing? Planning on staying here and performing black magic on me? Are you going to kill me?" Marpa commanded that he tear down this magician's palace and replace the stones where they came from and carry the earth back to its place. 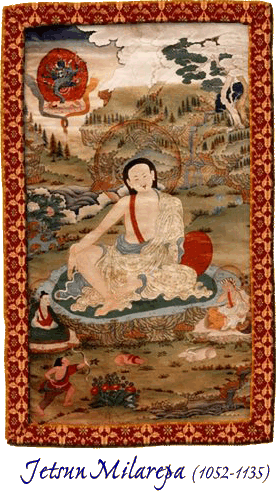 Once more Milarepa returned and reported to Marpa that he had fulfilled his command. Marpa replied, "Well, what do you need then?" "I need the Dharma. Please give me the Dharma," begged Milarepa. Marpa finally agreed and told Dagmema to make a very good meal and give it to Milarepa. Then Marpa gave him refuge vows and advice. He also gave him the short spiritual biography of Naropa that describes the twelve difficulties he had to go through. Marpa said to Milarepa, "I have given you now what is called the common or general Dharma. As I said, if you want the uncommon or exceptional Dharma, you must have the capacity to go through extreme difficulties to demonstrate faith in the lama and to maintain stable, unchanging samaya. Is this something you can do?" There are many aspects to this story of Milarepa's trials but since we do not have that much time, I will summarize. If you remember, there was a piece of land that was owned communally and that the villagers had signed a piece of paper saying that they agreed that no one would build on this piece of land, but Marpa had not signed the document. The fourth house that Milarepa built was to become the famous nine-storied tower called Se Kar Gu Tok, "the house with nine stories for the son." Marpa had drawn the plan for it on the ground, and Milarepa had started the construction. As the tower was located on the land of the village where no one was supposed to build, the people became concerned: "What's going to happen with this house that's going up on our land?" Some thought, "Well, maybe Marpa won't really build it. He's started all these other houses and they've come down." Other people said: "Well, I think he's just crazy. He's having all these houses put up by this student who's real strong. Three-cornered houses and four-cornered houses, and they're just going up and down and this one is going to come down, too, just like the rest of them." And then they said, "If he doesn't destroy this house, then we'll gather together and fight him. We'll bring it down ourselves." The nine-story tower was built all the way up to the top. The only thing missing was the roof. At last when the villagers realized that this one was not going to be destroyed, they got together and decided to attack it. Realizing what was happening, Marpa created an illusory army that circled the tower in all directions preventing anyone from coming close. The villagers were astounded. "Where did all these soldiers come from to protect Marpa?" Seeing they were up against a force beyond their strength, they went to Marpa, apologized, and promised that they would not destroy this tower. Following this incident are a number of stories about the difficulties that Milarepa went through in finishing this last building, but you can read about all of these in his spiritual biography. In brief, no matter what Milarepa did, Marpa did not give him the teachings. Milarepa finally despaired: "It looks as if I'm not going to get Dharma teachings from Marpa. I'll have to go to another lama." He went to Dagmema, and explained his thoughts to her. She consoled him, "Well, it's all right. You're not to blame for this. The lama's very difficult, and he's given you a difficult time. Keep working on the house, and I will work something out so that you can receive Dharma teachings." One day, Dagmema wrote a letter making it seem as if it came from Marpa, and sent it to one of his main disciples, Lama Nyokpa. It read, "I'm extremely busy. There's much to do, too many students, and I can't give teaching to this Great Magician. Please, give him some Dharma teachings." There was a festival coming up, a grand ritual celebration, and Dagmema had made some beer, actually very strong beer, which she gave to Marpa during the ceremonies. He got quite drunk and she was able to take his seal and stamp the letter. In Tibet, letters are not signed, but stamped with a personal seal, which is guarded carefully. Then Dagmema borrowed, so to speak, a ruby mala that had belonged to Naropa and also bone ornaments that had belonged to him. She sent these along with the letter as a sign that this was the real thing. Giving the letter, the ruby mala, and the bones to Milarepa, Dagmema said: "Here, take these blessed objects and this letter, but don't say I'm the one who gave them to you. Pretend they are from Marpa and that you are one of his disciples. Take these to Lama Ngokpa. I will say prayers for you. Practice diligently. Don't have any wrong views about Marpa. I have great hope that you will indeed receive teachings from him eventually." She gave him tea, butter, and something like Tibetan cheesecake and sent him on his way. When Milarepa left, he was of two minds. On the one hand, he was very happy because he was finally going to receive the Dharma, and on the other he was sad for he had to separate from Dagmema, who had been so kind to him. He shed tears and asked her, "Please do not forget me. Keep me in your prayers. Make prayers that we will meet again, and I will do the same." And so he parted from her. As Milarepa went along his way, he asked where Lama Ngokpa's house was and finally found it. 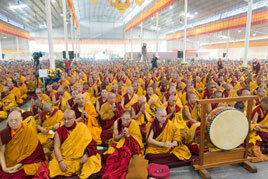 As he approached, Lama Ngokpa was sitting on a high throne teaching many thousands of students. When Milarepa came to him, he was reciting these lines: "I am the one who explains, I am the Dharma that is explained, and I am those who have gathered to hear the teachings. I am the guide of the world and the one who creates the world. I am of the world and beyond it. I am the true nature of spontaneous bliss." 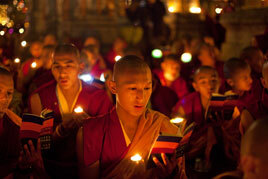 In Tibetan tradition, the point at which teachings are interrupted by such an event are considered very significant. Milarepa bowed to Lama Ngokpa from a distance. The lama stood up on his high throne, took off his hat, and bowed in response to Milarepa's prostrations. 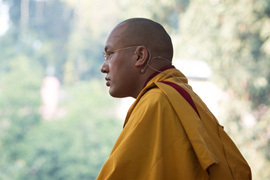 The students were surprised and asked their lama, "Who is this that you're treating with such respect?" Lama Ngokpa replied, "Ask him who he is. His way of prostrating is like that of Marpa, so I assumed he was his disciple and bowed to him." One of the students approached and questioned Milarepa who responded as Dagmema had told him—he lied. He said that he was a student of Marpa's, that he had come to take Dharma teachings from Lama Ngokpa, that Marpa had sent him, and that he had brought a ruby mala and bone ornaments from Naropa as confirmation. When Lama Ngokpa heard this from his students, he was extremely happy. "Wonderful! Tell him not to come right away, but to wait." 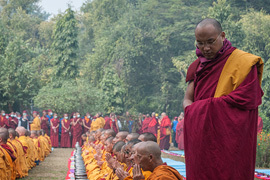 The students brought Milarepa some beer to drink, and said that they were going to form a great procession for him in the traditional style with victory banners, music, and the monks wearing all their fine robes. Milarepa was asked to wait until they could receive him properly. He was exuberant. With all the brilliant ceremony he thought had arrived in the land of the gods and now at least he was going to receive the teaching. He reflected this was all due to the kindness of Dagmema and shed tears remembering her. Lama Ngokpa gave Milarepa teachings and also taught him how to practice. Milarepa meditated for quite a while, but nothing happened—nothing at all. There were no signs of realization, no experiences, nothing. 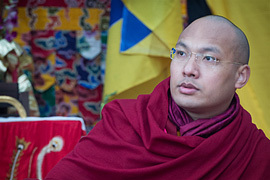 Lama Ngokpa was astounded: "With these teachings, there's no way that nothing can happen. What's going on?" He began to have some doubts, so he questioned Milarepa more closely, and finally Milarepa told the truth: "Well, actually, that letter wasn't from Marpa and neither was the mala or the bone ornaments." Lama Ngokpa replied, "Well, that must be the truth, because without the lama's blessing, experience and realization cannot arise." About this time, a letter arrived for Lama Ngokpa from Marpa. It read: "The house is finally finished and I'm going to have a big celebration in honor of this occasion. Please come with your students and bring whatever you have to offer. As for that lousy student of mine, you can bring him along, too." Except for one goat with a bad leg, which he thought wasn't good enough to offer and thus left at home, Lama Ngokpa took everything he had gathered throughout his life as an offering to Marpa. As they approached Marpa's house, Lama Ngokpa felt a little tired, it having been a long journey, and so he said to Milarepa: "You go on ahead, and from the house bring me out some beer to drink. Before we get there, I'd like to just rest up a little bit." Milarepa went to the house and met Dagmema, who was delighted to see him. 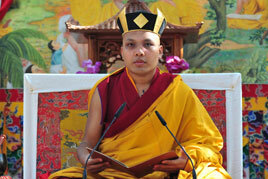 He delivered Lama Ngokpa's message and Dagmema said, "Fine, but first we should go and greet Marpa." Milarepa explained to Marpa that Lama Ngokpa had come, that he was a little tired from the journey and that he would like some beer. Marpa became furious: "What! I went to India at the risk of my life to get this Dharma teaching from Naropa. No one was there to greet me with beer. What's this person talking about? If he wants beer, he can come to the house." Once again Dagmema demonstrated kindness, and sent beer out to them. Soon, the party arrived at Marpa's house. Lama Ngokpa then said to Marpa, "I give you power over my body, speech, and mind, and all the wealth that I have. Whatever I possess, I offer to you. The only thing I haven't offered you is one goat with a bad leg. I ask you to give me the special instructions of the Dakinis." Marpa replied, "All the other Dharma I know I have given you, but if you want to receive this secret instruction of the Dakinis, you'll have to bring me that goat." Lama Ngokpa himself went back to his house and fetched the goat. It took him one day to return to his house, and then he walked the whole night back with the goat on his shoulders and offered it to Marpa. Marpa was very happy: "In order to receive these teachings, I really didn't need this goat. However, there was a purpose in your going to get it. You demonstrated great respect for these teachings, and showed that you're the proper kind of student. Whatever kind of difficulty you're given, you're able to carry through. (Literally rendered, the Tibetan text reads: "you're not satisfied with any hardship; you keep taking on hardships one after the other.") This shows the strength of your devotion." Lama Ngokpa and all his students assembled for the initiation, and one more time Milarepa was not allowed to attend. At this point, he was totally miserable. He was so disappointed he said: "I'm going to jump in the river. I'm going to end it all. This is more than I can take." As he lifted up his things to put them on his back, he reflected that this indeed was a human body he had attained, despite having done a lot of negative things; moreover, in the future it wasn't certain that he would again attain a human body and meet a real lama. So again, he decided to stay and remained in a very distressed state of mind. Through his omniscient knowledge, Marpa knew what was happening within Milarepa's mind. When Dagmema came before him again, she said: "Through all these hardships, this wonderful student of yours has neither rejected you nor the Dharma. Not once has he turned his mind away from the Dharma no matter how difficult it was." She begged Marpa to give him teachings. Marpa finally assented and told Lama Ngokpa and his students to fill the shrine with abundant offerings, for that day the guest of honor would be Milarepa. First, they made a place for Milarepa to sit because he didn't even have a seat of his own. Then Marpa briefly gave him a teaching on the Dharma in general, which included fulfilling the commands of the teacher and undergoing hardships for the sake of the Dharma. During the initiation of Chakrasamvara, Milarepa experienced directly the face of the yidam deity. Marpa held up a kapala filled with amrita, which functioned as a support for visualization. He dipped his index finger in the amrita and told Milarepa to look at it with great faith. In the sky in front of him, Milarepa saw the full mandala of Chakrasamvara—the main deity and retinue with all the offerings complete. In complete unity with the deity Chakrasamvara, Marpa made a prophesy about Milarepa based on the empty copper pot with four handles that Milarepa had given him when he first came. The four handles represented the four main heart sons of Marpa, of which Milarepa was one. The fact that the pot was empty meant that he was going to have some problems with food during his practice in this life, but Marpa had filled it with melted butter and this meant that, in the future, his lineage would be very fruitful. He would have many excellent students and through them, the Buddha's teaching would spread widely. Gods and men would sing praises to Milarepa and he would be able to prolong his life through the practice of samadhi. Above in the sky, all the gods were happy. In the earth, all the nagas were happy. And in between, in the realm of human beings, everyone was happy. After receiving initiation into the lineage of the deity, the reading transmission, and the secret oral instructions for the practice, Milarepa began his formal practice by going into retreat for eleven months. Balancing a full butter lamp on top of his head, he stayed in a cave that was walled in. Day and night he practiced in this way. At the end of the eleven months, Marpa and Dagmema came see him. Through the sealed cave, Marpa asked him, "You've been in retreat now for eleven months. Tell me, what are your experiences? What are the realizations you have achieved?" Milarepa had been inside the cave for so long he was hesitant to come out. He didn't feel he could break down the wall himself, as he had taken a vow to be in retreat. Ever helpful, Dagmema said "You're right. I'll break it down for you. Then come out swiftly to meet your teacher, for your minds are in harmony. You have not broken any of your promises, so it's all right to come out." The wall to the cave was broken, and Milarepa emerged, made prostrations to Marpa and received his blessing. Milarepa was then led into the circle of disciples. Marpa gave Milarepa a kapala (skull cup) full of amrita, and Milarepa drank it all. Then, together with all the disciples, Marpa gave teachings on the nature of the mind. In addition, he bestowed initiations of various yidam deities, which matured the vajra body, speech, and mind of Milarepa. (It was these yidam deities who gave Milarepa the name Zhepa Dorje, the Laughing Vajra.) There were many auspicious signs at the time, such as flowers falling from the sky. Marpa and Dagmema gave Milarepa another name: Mila Dorje Gyaltsen, Vajra Victory Banner. After the initiations, Marpa gathered all students around him and addressed Milarepa. "Great Magician, you are my karmically connected son. I knew this from the very beginning. When I was plowing the field, that was my way of going out meet you." 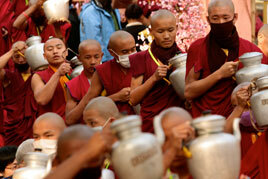 (In Tibet, there is the tradition that when someone important comes, you don't wait home, but you go out to meet them. The more important they are, the farther out you meet them.) "However, you had killed many people and other sentient beings. In order to purify these negative actions, you had to go through all trials. Eight times you were thrown into despair. All these occasions were to purify negative actions, to make stronger your renunciation of samsara. Now, during this time, my wife, Dagmema, who has great compassion, was very kind to you. She gave you food and comforted you again and again, but this made for an imperfect situation. She did not challenge you enough, and, therefore, not all of your negative actions have been purified. You must go to a solitary place in the mountains and practice in retreat to slowly purify yourself of these negative actions. Although you went through great difficulties, never did you have wrong views, either about Dharma or myself. This is very wonderful: due to this circumstance, in the future your students will be genuine practitioners. They will also have faith and will not generate a negative view." 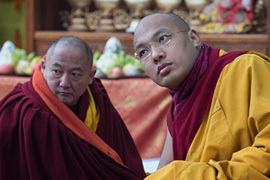 Marpa continued: "The view and the practice of Dharma that I teach is extremely important, wondrous, and most unusual, because within the secret Vajrayana, there's a special link between the lama and the student. Whatever happens between the two of them happens in order to develop the qualities of the student. If anger arises, it's not a normal arising of anger. There is a purpose to it. All of the Dharma teachings that I brought back from India at the risk of my life, I will give to you. First, you have stayed eleven months in retreat, please tell us what kind of experience and what kind of realization you have attained." Milarepa responded: "Thanks to the blessings of the Buddhas, the Bodhisattvas, my lama and his wife, I was able to attain a little bit of experience, a little bit of realization. In this completely matured body, this physical form of mine, it is possible to reach Buddhahood. This body is a boat that will take me across samsara to Buddhahood. However, it's also possible that I can use this very body to accumulate negative karma, and this will lead to rebirth in the hell realms. There is a choice. I can turn my mind towards positive activity and achieve Buddhahood in one lifetime or I can turn my mind toward negative activity and go to the hell realm. 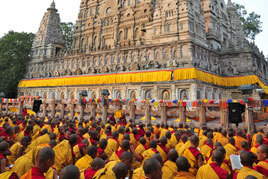 In order to cross over this fearsome ocean of samsara, the only protection is the Buddha, the Dharma and the Sangha. I go to them for refuge. Amongst these three, the most important is the lama. 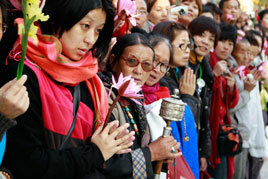 It is through faith and samaya with the lama that protection comes. 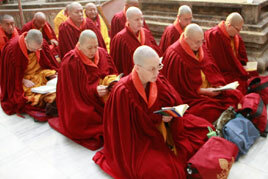 Within the Tibetan tradition, after one receives an introduction to the nature of the mind or some instruction from a lama and practices it, one offers to the lama one's experience of realization. Whatever happened during the practice, exactly as it happened, without exaggerating or without forgetting anything, one relates only to the lama, not anyone else. Marpa was extremely happy with Milarepa's account: "This is most excellent. You are truly a karmically connected, strong student. And in the future," Marpa said, "I will give you progressively all the oral instructions, and you must then give yourself fully to these practices." After celebrating Milarepa's emergence from the retreat, Marpa gave him more instructions in private for his next meditation practice. Not long into the next retreat, though, a blue dakini with golden hair, eyebrows, and eyelashes appeared to Milarepa in a dream . She said to him, "Practicing the Six Yogas of Naropa is very good. However, there is one teaching that has not been obtained. It's called 'The Instantaneous Attainment of Enlightenment.' It is a kind of powa practice enabling you to send your consciousness into another body after you die. You must go ask for this." Having given this advice, she disappeared. Milarepa then broke down the wall of his cave and went to Marpa, who was astounded to see him. "Well, I just put you in retreat, what are you doing here? Why did you come out so quickly? Isn't this an obstacle to your practice?" Milarepa explained to him that a dakini had appeared to him and told him that this teaching of powa had not been received and that it should be asked for. "Was this appearance real or not? Was it a hindrance or not? Please tell me," he asked. Marpa replied, "This is a true prophesy from a dakini. When I was with Naropa, he did speak of this kind of powa practice, but I really don't remember whether I have received the teachings or not." So they pulled out all the texts that Marpa had brought back from India, and spent days going through them looking for the teaching, but they could not find it. So Marpa again undertook the arduous journey to India to meet Naropa. Marpa did not find him in his usual place, as Naropa had become a realized siddha, and moved freely. After a long search, he found him, and together they went to Pullahari, north of Bodh Gaya, where Naropa had a place of retreat. It was there that Marpa asked Naropa for the powa instructions. Naropa asked: "Is this something coming from you yourself? Did you want to receive this, or is this something that a yidam deity told you to request?" And Marpa said, "No, it isn't from me. I did not receive this from a yidam. It was my student Good News." Naropa put his palms together and, bowing towards Tibet, he recited these famous four lines: "In the thick darkness of the north, like the sun glistening on the snow, there is one called Good News; it is to this one that I bow." 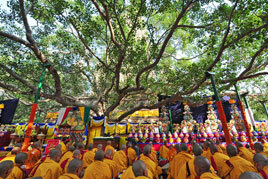 It is said that at Pullahari, all the trees around the retreat hut of Naropa remain bowing towards Tibet. Naropa also gave Marpa many other teachings, including the Whispered Lineage of the Dakinis. He prophesied that, in the future, the Dharma lineage of Marpa would be masters of this practice, and that his Dharma descendants would maintain his lineage and practice it well. When Naropa had finished giving him these teachings, Marpa emerged from the hut, and once outside he bowed again to Naropa. (This was actually the last time he met him.) As Marpa was making his bows, he left a footprint in the rock that is still visible. When Marpa returned to Tibet, he gave Milarepa, his main disciple, every single initiation that he had received, including the Whispered Instructions of the Dakini lineage. Marpa told Milarepa and the assembled disciples, "Now I have given you everything I received from Naropa." There were, however, other disciples of Naropa who received different teachings, and Marpa encouraged Milarepa and his other students to go and meet them in order to obtain the remaining instructions. In this way, Marpa's students would maintain Naropa's lineage. While Marpa was in India, Naropa had also prophesied to him that Milarepa should go back into retreat and pointed out a particular cave. Following these instructions, Milarepa went back into retreat, with the continuing support of Marpa and Dagmema. During this practice, he had deep experience and realization. After many years, Marpa called all of his students together. He said, "We are maintaining the lineage of Naropa, and we should now look into the future to see what will happen to this lineage. Tonight, watch your dreams carefully, and in the morning, let me know what you've seen." Milarepa dreamt of four great pillars, one in each direction. In the eastern direction was Tsurton Wangye, one of the four main disciples. The snow lion on top of his pillar signified that he had a heart like a lion. In the southern direction was Lama Ngokpa, to whom Dagmema had sent Milarepa for teaching. On top of this pillar was a tiger, symbolizing the character of Lama Ngokpa. In the western direction was Meton of Tsangrong, and his symbol was the garuda. On the northern pillar was a vulture, and this represented Milarepa. Each one of the four has an extensive explanation but here we will focus on Milarepa. In Tibet, the vulture is considered a being who can endure all kinds of hardship. Vultures also come to eat the bodies that are offered at the cemeteries. They can even eat the bones, which indicates that they have a lot of fire in their bodies that allows them to digest anything. Milarepa's specialty was the practice of tummo, which is related to fire. In the dream, the vulture's feathers were all in place and they were beautiful with no fault whatsoever. This was a sign that all of the instructions Milarepa received would abide within his mindstream and he would remember them perfectly. The vulture's nest is usually high up on the rocks, and this was a sign that Milarepa would have a long life. Milarepa also dreamed that the vulture had many offspring, and that was a sign that Milarepa would have incomparable disciples. Flying around the vulture in the sky were many different kinds of birds. This was a sign that the Kagyu teachings would increase and spread. The vulture's eyes looked upward into the sky, signifying that Milarepa had cut his ties to samsara and that in the future, he would not need to take physical birth. At the end of the dream, the vulture flew into the sky, showing that Milarepa would reach the expanse of liberation, or the level of Buddhahood. After interpreting the dream, Marpa said, "I have explained all this to you and my work now is finished. It's your turn, my disciples, to do the work. And if my words are not false, but true; and if they have the strength to endure, then in the future, this practice lineage will flourish." According to Marpa's prophesy, one of the little vultures represented Gampopa, who became one of Milarepa's foremost disciples. It is said that his sun-like disciple was Dakpo Laje, the doctor from Dakpo, or Gampopa, and that his moon-like disciple was Rechungpa, Rechung Dorje Drakpo. Milarepa had many other close and highly realized disciples who taught and matured their own disciples and so the lineage continued. 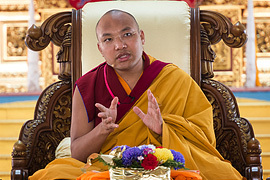 Flowing from Milarepa's teaching and lineage, the Kagyu tradition did spread and flourish. This teaching was given at Karma Triyana Dharmachakra by Bardor Tulku Rinpoche in December of 1992. It was translated and edited by Michele Martin.